The Easy Slope Safety Steps have been load tested in 2018 by a UK specialist lifting equipment testing & design company who are members of the Lifting Equipment Engineers Association. They were tested to a max. load of 300 KG evenly distributed on the platform applied using calibrated test weights. As far as we are aware, no other manufacturer tests to these vigorous standards. Why jump for that box when our Easy Slope safety steps are a safer and more luxurious way to gain altitude in the workplace? The 45 degree slope is the key. Some people who normally balk at any and all steps can be coaxed to do their own jobs themselves. These steps are a less intimidating alternative to traditional stepladders, and provide a steady working platform for the user. These steps reach heights ranging from 648 to 2591 mm in 5-12 vertical steps in two widths for your to choose from our standard 560mm variety to the extra wide 760 mm. Wheels allow you to get these steps to any place with a worker altitude deficit and the lever locking hand bar means they will stay where you lock them in place. The top platform is enclosed on 3 sides for safety. What is the purpose of easy slope safety steps? Safety steps are invariably required as part of any standardised safety programme in most industrial and commercial settings. However, the steep slope of the typical safety steps may not be suitable for everyone to use, especially those known to have medical problems that prevent them from climbing steep gradients. This product is an ideal alternative to steeper-sloped safety steps. The gentle 45-degree angle of ascent and descent makes it a better choice for those with medical conditions as mentioned above. 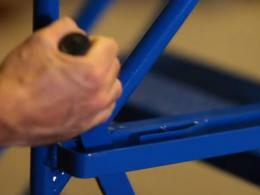 The hand-operated locking bar also provides superior safety and stability while the unit is in use. Where can easy slope safety steps be used? These safety steps can be used practically anywhere; wherever there is a need for safety steps but a standard product just won’t do, this product comes to the rescue. The term ‘easy slope’ comes from the gentle gradient of this product – one that is convenient for people who cannot climb steep steps. These steps could be used in a variety of workplaces, such as libraries to reach top shelves, or as warehouse steps to assist users in comfortably accessing high up shelves. It can also be used in spaces that allow for a longer rise for a particular level of elevation, such as aircraft hangars and other specialised places. It can also be used in warehouses where space is not a constraint and in factories and other industrial units where employee safety and comfort are important. Platform steps may also be easier to manoeuvre than folding ladders, resulting in this product being accessible for a wider range of users. Who might use these Mobile Ladders? 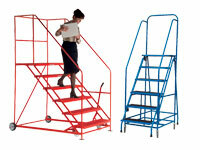 Anyone who finds it difficult to negotiate regular mobile steps will see great value in this product. From a relatively short platform height of 1080mm on the 5-tread model, this product line ranges all the way to the mammoth 12-tread unit whose platform height measures 2591mm, or 8.5 feet. The safety locking bar is hand-operated and will ensure optimal stability while using the safety steps – another consideration for those unable to use normal steps for any reason. The dual-side handrails are another safety aspect of this unit that makes it a popular product with most buyers. 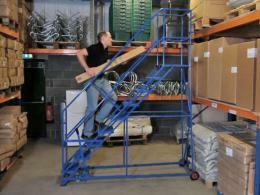 The easy slope safety steps are available in a multitude of height and colour options. 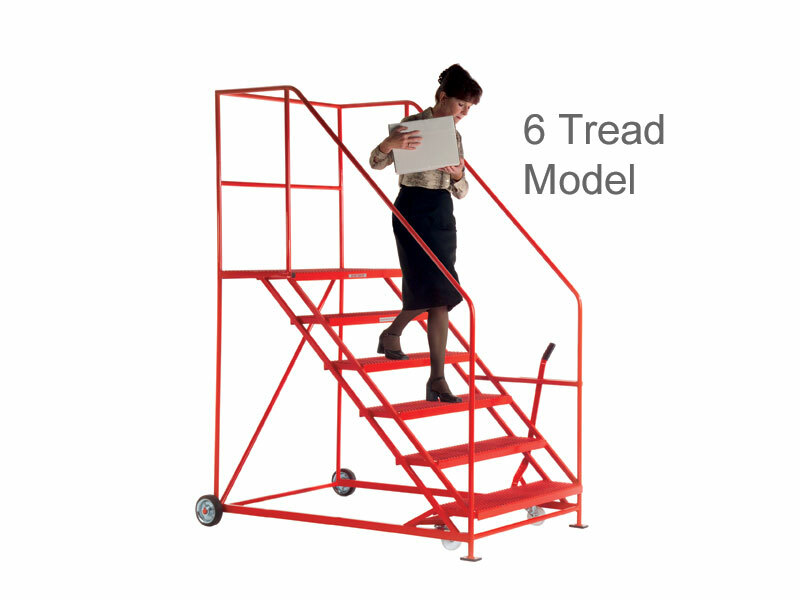 For relatively low-level work, the 5-tread model is ideal, while for more height-intensive needs, the towering 12-tread unit would be better suited to the job. Cushion rubber tyres ensure smooth operation. Platform area comes in two options: the standard 560mm and the extra-wide 760mm. Treads are standard 250mm deep with a punched metal texture for superior grip while climbing and descending. The product is covered under a standard one-year parts and labour warranty and is manufactured in the UK. There are several size and tread options to choose from in this range of easy slope safety steps. Starting at 5 treads, the models go all the way up to 12 treads. All models have the same convenient 45-degree gradient suitable for those who find it hard to manage going up or down steeper steps, such as ladders.